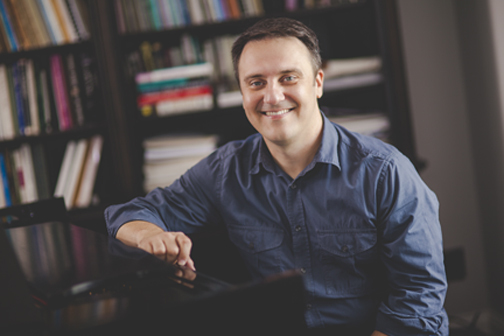 Jason Webb: Bio & Choral Music | Santa Barbara Music Publishing, Inc.
Jason Webb is enjoying a diverse and impressive career as a recording musician, producer, arranger and composer. A native of Dayton, Ohio, he began studying classical piano at age 5 and within a few short years developed a prodigious technique and the ability to play “by ear.” He began playing professionally at age 14 and became highly sought-after, exhibiting musical ability and maturity far beyond his years. After graduating high school, Jason’s ever increasing talent earned him a scholarship to the prestigious Cincinnati College-Conservatory of Music, and he subsequently earned degrees in Music Education and Jazz Studies. In 2000, Jason realized a life-long dream by moving to Nashville to become a recording musician. Since that time he has played on scores of recordings, providing music for singers, songwriters, record labels, publishers, movies, TV, and video games. In addition to his busy recording session schedule, Jason is becoming increasingly involved in arranging, composing and producing. His arrangements and compositions have been performed and recorded by artists and ensembles all over the world. Jason lives just north of Nashville in Hendersonville, Tennessee, with his wife and two sons. Jason Webb has 5 titles published with Santa Barbara.